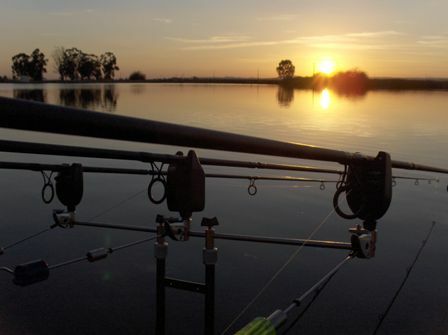 Lake Alfarofia is a small fishing paradise of 15 acres just outside Elvas in Portugal, close to the spanish border and city of Badajoz. This private lake was opened to the public at the end of 2007. It has not taken long for this fantastic water to come to the attention of tope European anglers due to the size and fabulous condition of its inhabitants both common and mirror carp. A destination for many specimen hunters. In the middle of private property of 103 acres, it was constructed for the purpose of rice field irrigation. Its construction was finished in April of 1992 ( Photos ) and in July of that same year, it was stocked with 1.500 mirror carp and 1.000 black-bass. 15 years later it has now been discovered by carp anglers. The lake has a surface of 15 acres with a capacity for 100.000 m3. The average depth is 3-4m and 6 meters at the deepest point. During the year, the water is constantly renewed. Water leaves the lake to irrigate the fields and is replaced from an irrigation canal. This creates excellent water quality which is well oxygenated, and at a constant level through out the year. The lake has a plentiful supply of crayfish and has 7000 m2 of reed beds, creating a natural habitat for the feeding and reproduction of the fish. Due to the presence of the black-bass (predators) carp populations have been kept under control, creating a perfect balance. Carp fishing began in January of 2007 and until now, the largest caught to date has been 52LB, having said that a large number of 40LB fish have also been caught and the true potential has still to be discovered.